WARNING!!! This post is not about states’ rights. John C. Calhoun is one of the most infamous “war hawks” in American history. 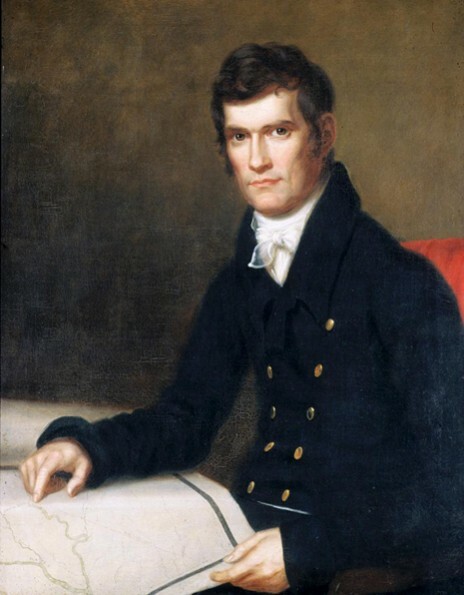 On the eve of the War of 1812, Calhoun noted that a second war for the protection of American liberties was not necessary, but that it would be a positive thing. He believed a second war would energize another generation of American patriots. What amazing rhetoric for someone that never stood against a British line of fire. However, following the War of 1812, Calhoun had new sentiments about America’s “defenses.” Disgust. I chose this portrait of Calhoun because it shows him a more glorious pose, rather than his inglorious photos with neck beard and crazy hair. His eyes have the look of intent. His face is stern and strong. Perhaps the look of certainty? His hand, pointing to a position on a map. This Charles Bird King portrait of Calhoun, painted during his tenure as Secretary of War, displays the military vision of Calhoun. Learning from the failures of the war of 1812, Calhoun sought to revitalize the American military standard. Calhoun advocated what Lawrence D. Cress called the “moderate Whig” intellectual tradition towards military. This tradition called for a regular army (as in standing not skeletal) that remained in full Parliamentary control. Or in the case of America, the army would be under Congressional control. Many felt that a well trained and disciplined professional army performed better in combat and in societal functions. This plan further called for the training and maintenance of a professional officer corps. to accommodate the increase in army size. Calhoun presented his “expansible army” plan in December of 1820. He argued that if any reduction of armed forces took place, that it should be refined to the ranks of the regulars but not the officers, thus maintaining a strong element of leadership. This can be interpreted as a highlight in American military history as it dictates a progression towards standardization. But more importantly, this plan demonstrates a Civil relationship, between government and military, never before achieved in such a manner by the United States. Fish’s quote demonstrates a couple of things. One, it shows that the government fully believes that the well trained officer staff could train recruits efficiently at fast rates. This allows the government to maintain a level of professionalism in the army, without maintaining a large standing army. This moderation between the “Radical” and “Moderate Whig” traditions became the basis of the American fighting force for quite some time. Fish also displays the amount of civil control the government has over the army. The ability to raise and train the officer staff through congressional appointments and recommendations to West Point gave Government the power over officers. In 1846 the Army saw another enlargement as America transitioned into a Western military power with efficient soldiers and a well trained class of officers. Under the Presidency of James K. Polk, the American military structure reached Clausewitzian fruition. The vehicle of military progress, set in motion in large part by John C. Calhoun, finally emerged to fulfill America’s new military strategy…..expansion. Russel Frank Weigley. The American Way of War: A History of the United States Military Strategy and Policy. William B. Skelton. Samuel P. Huntington and the Roots of the American Military Tradition, The Journal of Military History.